In this course, you’ll start by learning about the typical threats that the security tools in Integration Services help protect against. Then you’ll learn how to control access to packages stored in the Package Store in SQL Server, about the available roles and how to create a custom role, as well as how to sign a package with a digital certificate. Then you’ll learn about the new security features that come with the SSIS Catalog introduced in SQL Server 2012, which more closely emulates the security scheme in the SQL Server database engine. This course assumes that you have a basic familiarity with the concept of relational databases and a basic understanding of what SQL Server is and the high-level tools in it, as well as how to create and manage objects using Management Studio. 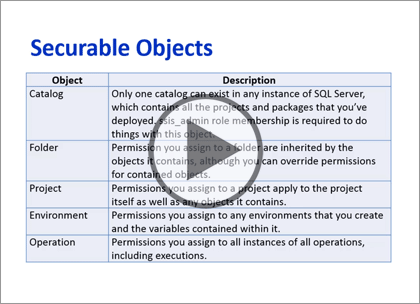 You should also have a basic understanding of how SQL Server implements security, including its authentication and authorization schemes, and how to assign permissions on securable objects to principals. You should know the fundamentals of Transact-SQL to write queries to retrieve data and join data from multiple tables, and how to execute scripts using the query editor in Management Studio. You must also know how to connect to an instance of SQL Server 2012 or 2014 using the various connection dialog boxes in Management Studio and development tools. It will be very helpful, but not absolutely necessary, to have experience with .NET development using Visual Studio 2013 or later for the portions of the course that deal with SQL Server Data Tools (which is a lot of it). At the very least, we’ll assume that you are well familiar with the Visual Studio user interface. This course assumes no prior knowledge of SQL Server Integration Services beyond what is covered in the previous SSIS courses.